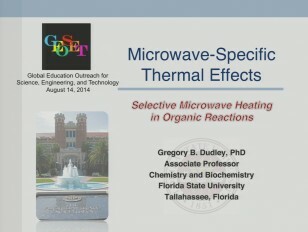 In part three of this three part series, FSU chemist Dr. Gregory Dudley, summarizes the conclusions of ongoing FSU microwave chemistry research. He discusses the implications and future prospects of microwave research, addressing how other labs could further unlock the potential of equipment they already own. Microwave + Photoelectron Spectroscopy of Thiacarbonyls, Phospha-alkenes and -alkynes, Boron Sulphides C=S, C=P, B=S, etc.